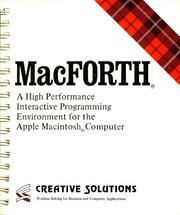 In 1984, FORTH came to the first Macintosh as MacForth. I coded some apps with it in 1986/7 on a Macintosh and later on my Macintosh Plus. From all the apps I wrote, I kept just one, as a paper source code listing : Backgammon , which I started coding in 1986 but never really finished. So, for memory's sake, I publish it on my website so you and I can enjoy reading and looking at it, whilst thinking about the first days we had a fabulous MacPlus to work with. BTW, there's still some activity around FORTH on Github .